The Adobe Flash Player is required to hear the audio portion of this website. 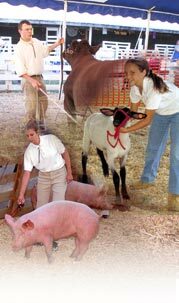 Starting in 2013 all 4-H Youth enrolled in a livestock project area will be required to complete this online course one time in order to stay enrolled in a livestock project area. The Quality Assurance and Ethics Certification has been developed to review what is expected of youth when preparing for and exhibiting animals in competition. Once you complete this program, you will earn your certificate of completion for the Quality Assurance and Ethics Certification requirement and will be eligible to show your livestock and stay in your 4-H project area. If you have already registered for QAEC, you can resume where you left off by entering your token below. Otherwise, continue by clicking the “Next” button.